Rumours are circulating via the Internet that estranged wife of Sir Paul McCartney, Heather Mills has actually died and been replaced with a double. The rumours say that recent news reports contain coded messages hinting at the truth. The clues are apparently revealed using acrostic techniques such as selecting every 3rd letter of allegations in The Sun newspaper and reading the Take-a-Break crossword clues backwards. "As more and more evidence comes to light we are building up a better picture of what really happened to Heather Mills and the true identity of her replacement," said Geraldine Billingsworth who runs the 'Tinfoil Hat' blog. "There is loads of stuff in that interview where she takes her false leg off. If you play it backwards." Conspiracy theorists say that they have so far determined that Ms Mills was involved in a road accident whilst using the pedestrian crossing in Abbey Road, St Johns Wood, London in the early hours of Wednesday, September 9th 2002. They say that her artificial leg became detached causing her to stumble into the path of a vintage Austin-Healey sports car whose driver had not realised the lights had changed. She was attended to at the scene but was pronounced dead at precisely 5am. "The clues are all there if you know where to look and apply a little intuition and imagination," said Miss Billingsworth. "It is the only logical explanation as to how such an idyllic marriage of two such wonderful people, one the nicest Beatle, who have brought so much joy and support to the world, could have gone so wrong. It is not Heather Mills at all, but a doppelganger by the name of Billie Shears. " A spokesman for Sir Paul McCartney said that the former Beatle was keen to clear the air to avoid any further damaging revelations in the media. "Obviously Sir Paul was traumatised by the death of his beloved Heather. However the couple had also signed lots of contracts for photo shoots and the landmine campaigning was going very well, so we thought ‘lets just use a double again’," explained William Campbell speaking from the McCartney country estate in East Sussex. "It backfired when the model look-a-like realised a divorce would be a good way to get hold of some of that Beatles fortune. I guess we should have expected that this might happen, after all the double got all the money 40 years ago too!" The name of the girl that caused the car to crash was Rita, not Billie. 28IF dude. The license plate says all. I am shocked at this... I just saw paul mccartney in concert and actually saw william campbell! Ha Ha Ha...very funny. Paul is not dead..he's well and alive! Just do your homework and do a little research. Everything out there is bogus! PS: Have a little respect for Paul...he's a "living" legend. Exquisite design, superior material, exquisite craft. discount ed hardy Close to her heart, the most perfect expression of your love. sure there are clues all over the beatles music and album covers but has anyone thought for a second that people were buying less and less albums because the music was changing? the beatles deliberately put "clues" in aeverything so they could sell more of theyre music. in the late 60s when this conspiracy really boomed everyone was waiting for the nexxt "clue" what better way to sell music than to give that clue to them with the music? OMFG - and with the truth about Lady Di coming out http://bit.ly/bWD3vf . this is absolutely ridiculous. the fact that people actually entertain the notion that this is a reality in any way blows my mind. the so called clues only work after being told what it is supposed to be. only a schizophrenic would see it without being told. and even then, they would be lead to it by their dillusions. First, let's look at the facts of MI5. Everyone at the accident scene has to die within days to weeks. Old girlfriend has to have an accident almost immediately. You don't threaten participants, you threaten their families. These are clear cut rules of a cover-up. They are not debatable. Beloved queens and kings have died without mass suicide. I somehow doubt a rockstar, no matter how loved would cause one. NUFF SAID! @ the anonymous dude who doubt that the death of a rockstar would cause a mass suicide. april 1994 kurt cobains death was followed by multitudes of suicides around the world. well documented. look it up. it really happened. That's called 'Social Darwinism'. It's how the gene pool cleans itself up. You kill yourself over rock star killing themselves? You're too dumb to pass on your genes. Elvis was as popular as ever and he died, im sure a lot of fans "went" with him. Its a hoax, a well thought out one at that. Unless someone can produce DNA? what more is there to say? 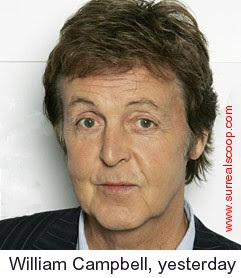 If Paul McCartney is alive where is William Campbell? Why they did not show them both in one interview or press con? As I write this letter from a glass onion I believe it is true that when we all wake up in the morning some things are more shocking than others including seeing people's real faces - figuratively and literally but it is also worth mentioning that beauty hardly ever sees itself even when it has a leg to stand on. In this case ironically lovely rita has run the meter up and the day tripper got out to see if the illuminated long and winding road could still give him a little magical mystery tour before the darkness comes calling. Thanks for post. examine the following article on WebWatcher app.